River Valley sophomore Brandon Call (11) attempts to drive toward the lane during the first half of Saturday night’s 54-38 loss versus Wellston in Bidwell. BIDWELL, Ohio — In the end, it was a matter of feast or famine from the field. 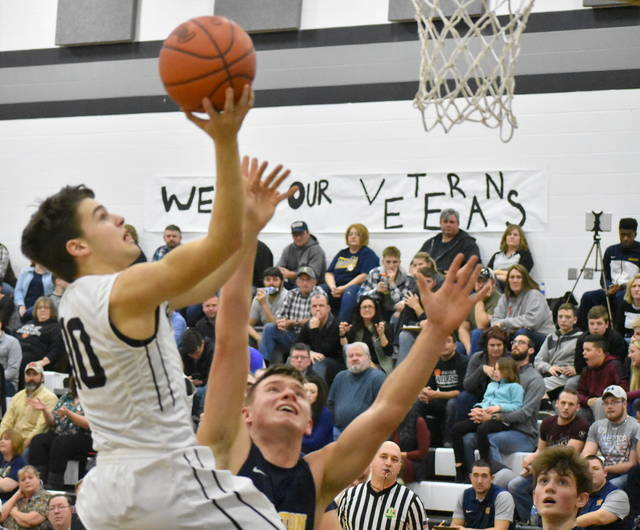 The River Valley boys basketball team hit a total of seven three pointers against the visiting Wellston Golden Rockets on Saturday night in a Tri-Valley Conference Ohio Division contest in Gallia County. 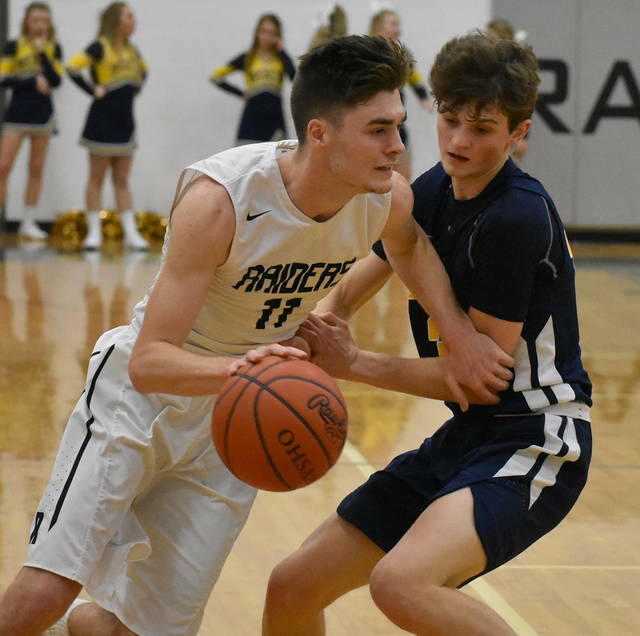 However, the Raiders (4-10, 2-5 TVC Ohio) managed to hit only three additional shots from the field the entire night as the Golden Rockets (7-5, 4-2) propelled to a 54-38 road win. The Silver and Black shot just 10-of-48 (21 percent) from the field, including 7-of-17 (41 percent) from beyond the three-point arc. The Blue and Gold countered with a 22-of-56 (39 percent) shooting performance, going 4-of-18 (22 percent) from three-point range. While the Raiders found the bulk of their scoring success on the night from long range, they also earned 11 of their 38 points for the game from the charity stripe. The home team shot 11-of-16 (69 percent) from the foul line as Wellston went just 6-of-15 (40 percent). The Golden Rockets dominated the boards throughout the night as they finished with 34 rebounds. River Valley mustered 19 rebounds in total, as they collected only five in the game’s second half. 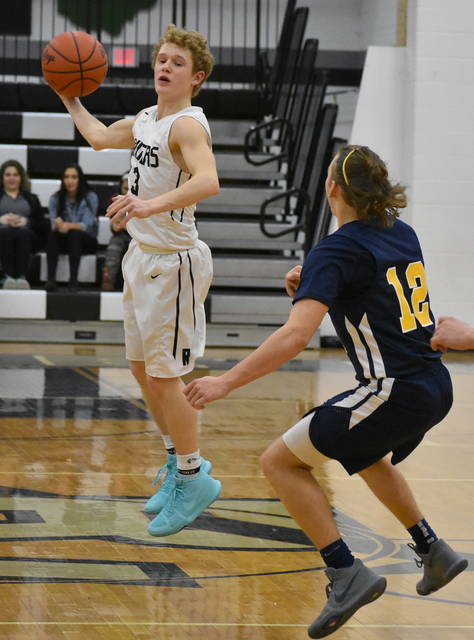 While no member of the Silver and Black finished in double figures, junior Rory Twyman and freshman Jordan Lambert each finished with nine points to led River Valley. All of Twyman’s points came as a result of trifectas, as Lambert finished with two field goals, including one three-pointer, and a perfect 4-of-4 performance from the free throw line. Seniors Dustin Barber and Jarret McCarley followed with six points each. Sophomore Brandon Call was next for the Raiders as he finished with four points. Rounding out the scoring for River Valley were senior Kyle Coen and sophomore Chase Caldwell, each with two points, respectively. Matt Simpson led all scores in the contest, as he helped guide the visiting Golden Rockets to victory with 18 points. Michael Graham was the only other player in the game to reach double figures as he finished with 11 points. Wellston’s Nick Heil hit three trifectas in the game to finish with nine points. Josh Bodley was next with six points and Rylan Molihan finished with four points. The Golden Rockets’ additional scoring came by way of Levi Bush, Eddie Smith and Brice Robinson each with two points. The Raiders and Golden Rockets are set to met for the second time this season on Tuesday night when River Valley travels to Wellston.